September 22, 2018 was the first official day of fall. The PERFECT day for a wedding - especially for a bride that loves all things fall! And the weather on this particular day definitely felt like fall! It was very cool, with a light breeze. The sky was filled with clouds, but the rain stayed away. It felt like a crisp, fall day at Vintage Oaks Ranch in Axtell, Texas. When I first met Tobie and Chad at their engagement session in November of 2017 I knew they were meant for each other. They just had “that” connection. A collage of images from Tobie and Chad’s engagement session. Their wedding day was filled with just as much love for one another! I don’t know how else to explain it other than contagious. You just look at them and you can’t help but smile. The ceremony took place at Vintage Oaks Ranch in Axtell, Texas and began at 6:30 pm. And just as you would imagine, it was filled with emotions…which included happy tears. Even Tobie’s grandmother was included in the day in a very special way. Tobie and Chad, I am beyond honored that you asked me to help capture the memories on your special day. Marriage is a journey that goes much further than your beautiful wedding. This was just the beginning of the path you’ll travel together as you overcome obstacles and weather the storms together - forever. I wish you both a lifetime of happiness! Special thanks to Angela Bailey with Angela Bailey Photography for assisting me in capturing the memories for Tobie and Chad! The week leading up to the wedding of Jack and Bailey on Saturday, September 15, 2018 was filled with tons of rain. The forecast was even calling for high rain chances for that Saturday. As the week crept by, those high rain chances slowly begin to decrease. As everyone continued to cross their fingers, Saturday arrived and those rain chances were pretty much gone. The sun was shining and it was a perfectly calm day. It was a picture perfect day - literally! That Saturday at 6:30 pm, under clear skies, Jack and Bailey would say, “I Do,” at the beautiful Wind Dancer Retreat in Bryan, Texas. with a shopping trip for a fancy dress. Jack would not tell Bailey why she needed the fancy dress. The next day Jack told Bailey that they were going to dinner that night and she had to be ready at 5:00 sharp...and she HAD to wear the new fancy dress. Bailey joked about dressing up for dinner at Texas Roadhouse! Jack laughed and told her to get ready. Jack and Bailey, I wish you both a lifetime of happiness. The amount of love and respect you both show each other throughout your words, as well as actions towards one another is so calming to all those that surround you. You both have tons of love and support from your families and that is absolutely priceless. Kaden is truly blessed to have such wonderful parents and grandparents in his life! Special thanks to Angela Bailey with Angela Bailey Photography for assisting me in capturing the memories for Jack and Bailey! September 1, 2018 was a beautiful day for a wedding for William and Victoria! After a very long, dry summer in Central Texas, the area suddenly began receiving rain. Isolated showers were in the forecast and the clouds began to build, but the clouds parted which gave way for the sun to shine brightly for their outdoor ceremony at the Knob Creek Chapel in Temple, Texas. 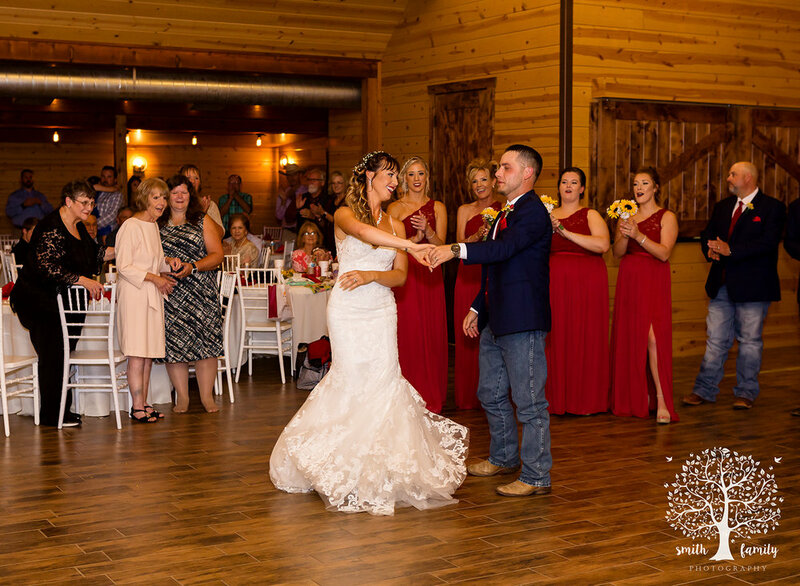 Victoria and William met online and had their first date on January 16, 2015 at the Farm House Restaurant in Mexia, Texas. After dinner the two laid under the stars in a pasture as they listened to music and enjoyed each others company. They continued to get to know each other over the next few months and then something unexpected happened. On July 7, 2015, at the young age of 22, William had a brain aneurysm. He was in a coma for two weeks in the Intensive Care Unity at Temple Baylor Scott and White Memorial. Slowly he healed by the grace of God, family support and the dedication from the medical staff. After nearly a month, on Victoria’s birthday, William spoke for the first time since the aneurysm. William told Victoria that he loved her! One week later he was discharged to Austin Neurological Rehabilitation where William had to learn how to walk, talk, write and eat again since he lost the ability to do these activities after he suffered multiple strokes from his brain injury. In October of 2015 William finally returned home. Each day he continues to improve. He now attends Texas State Technical College and is enrolled in the Aviation Mechanics Program. Victoria was inspired to become a nurse so she enrolled in the McLennan Communtiy College Nursing Program. She graduated in May of 2018 and now works at Baylor Scott and White Hillcrest in Waco. William proposed on June 3, 2017 outside of Leakey, Texas by the Frio River in front of the mountains. Victoria would soon become a stepmother to William’s five year old daughter, Alaya, and she couldn’t wait! Victoria says that Alaya is a blessing to both of them and it is a true blessing to have her in their lives. William and Victoria continue to further their education and commitment to each other…and to Alaya. August 4, 2018 was a very hot day, like most days in August in Central Texas. But this particular day was very important! This particular day was the day that Kelsey and Hunter would say, "I do," in Palmer, Texas. It all started with a simple introduction by Kelsey's sister. Hunter asked for her number and they began talking. Soon after this initial meeting, Hunter showed up at Kelsey's workplace one afternoon and said that he wanted to give her a ride home from work. Kelsey told him that she would like that and she returned to work to finish her shift. At the end of her shift, Hunter was there to pick her up. He said they had to go out to eat dinner first before he took her home. They had an amazing meal together where they enjoyed each other's company. After dinner they went to spend some time at Lake Clark, where they continued to learn about each other. As time went on, Kelsey and Hunter fell in love and continued to visit Lake Clark. It became "their" spot, which they marked by carving their initials into one of the trees. Eventually Hunter decided it was time to "pop the question." But where would he propose? You guessed it! He proposed to Kelsey at Lake Clark in front of the tree where they carved their initials. The same tree where they had their first kiss. And the same tree where he told her that he loved her for the first time. It was absolutely perfect! Kelsey and Hunter were engaged! When their wedding day arrived, they were both excited - yet nervous at the same time. Their wedding was simple and beautiful! But they said the best part of the entire wedding day was relaxing with each other after the wedding was over. When I asked Kelsey if she had any advice for couples that were planning their wedding day, she jokingly replied, "Don't do it! Elope!" as she laughed. Keith and Karen said, "I do," on June 16th, 2018 at the First Baptist Church in West, Texas with a reception immediately following the ceremony at Cottonwood Hall, also in West, Texas. The church was absolutely beautiful, complete with stained glass windows! And Cottonwood Hall was the perfect venue for the reception with a large dance floor and bar. Keith and Karen met each other at the beach while they were both on vacation. They were introduced by a mutual friend, Tina (also the matron of honor). Neither one was looking for a relationship, but they were encouraged to meet on a friend level rather than a relationship level. They ended up exchanging numbers and reluctantly arranged a first date hiking and searching for fossils in a creek bed. It was such an adventure...literally! They encountered a snake and a hornet's nest complete with four stings on that first date! Keith asked Karen to go on a second date. This time they would go...fishin'. They've been seeking adventures, fishing, and just enjoying spending time with each other every since. Exactly one year later, Keith proposed while they were on a family vacation at the exact same beach where they first met each other. They were surrounded by all of Keith's family. Keith and Karen were officially ENGAGED!! Keith and Karen love spending time outdoors together, going on adventures and fishing. Their honeymoon was actually a fishing trip to Rockport, Texas where they caught lots of trout and red fish. That is a trip that definitely fits their personalities! After all, Keith's ring is actually made with fishing line! Keith's ring is actually made with fishing line! As we photographed the wedding and captured special moments between them we quickly noticed that they were always surrounded by family. They have such an amazing support system with wonderful role models! The way that Keith and Karen look at each other is something from a fairy tale. It is difficult to describe, but can be felt by everyone around them. They have so much love and respect for one another. June 16th was not just Keith and Karen's wedding day. June 16th was also Keith's parents wedding day 45 years earlier! I was not aware of this until the ceremony when Tommy and Sara were asked to stand by Keith and Karen. Tommy and Sara being recognized for 45 years of marriage. Forty-five years! That is such a commitment of love! Tommy later told me that they have been through it all - richer and poorer, sickness and health, better and worse - and every single bit of it was (and continues to be) worth it. Such an inspiration! Keith and Karen even included them in the reception with a cake to celebrate their anniversary, the original cake topper from their wedding cake 45 years ago, a jar for anniversary wishes, and a special dance for them. I have to admit, it made me tear up! Tommy and Sara celebrating their 45th wedding anniversary. Keith and Karen, as I captured special memories of your beautiful wedding day I was deeply touched by the fact that you have an AMAZING family that surrounds you both and supports you both. While this was beautifully amazing, what was even more amazing was that you both appreciated this rather than taking it for granted. You truly do have something special. A special THANK YOU to Angela Bailey with Angela Bailey Photography for assisting me in capturing the beautiful memories from Keith and Karen's wedding day! On Saturday, May 26, 2018, Brooke and James made each other a promise in front of their family and friends - a promise to love each other forever. Brooke and James were married on a rather warm and sunny day in Thornton, Texas at the new Thornton Civic Center. Their wedding was actually the first wedding to take place there and everything was absolutely perfect! Brooke stated that the venue was so much better than she expected and I must say that I completely agree with her. The lighting in the building is incredible! There is so much natural light that pours in through the windows and completely fills the very neutral colored space. I LOVE the way the city of Thornton used parts from the old Thornton School building in their new civic center! James and Brooke first met when they were high school students at Groesbeck High School in Groesbeck, Texas. James was a junior and Brooke was a freshman. Brooke was dating James's best friend when they first met, however after a few months that high school relationship ended. James and Brooke soon began dating. Their first "official" date was going to a high school play that school year. This date led to many more wonderful dates over the years. Eventually, James decided to propose to Brooke in the driveway of the house he grew up in at Old Fort Parker State Park. But this wasn't his original plan. His plan was to actually propose to Brooke down by the water at the lake, but there was a problem. There was construction going on at the state park and they were in the process of building a new boat ramp at this time so James had to improvise. The driveway would have to do! James had a white Chevrolet pickup truck in high school and still to this day he owns and drives this truck. After all, it is his baby! James picked up Brooke on this particular day and drove to the driveway. He got out of the truck, ran to the front of the truck and opened the hood. Brooke had no idea what he was doing so she waiting in the truck patiently for James to finish looking at this truck. He finally walked back to the driver's side of the truck and leaned over to kiss Brooke...and then proposed! Brooke was completely surprised and answered, "YES," without hesitation! From the minute I met Brooke and James, I could tell they loved each other and were completely comfortable around each other. They were both very laid back and nothing seemed to stress them out at all. After years of high school and the years after high school, they are still so in love and respect each other. The way they look at each other is truly breathtaking! Family is very important to both Brooke and James and so it was vital that they were included in the details of the wedding day. Brooke's mom and cousins made the cakes and cupcakes. The cake stand was truly unique! It was a custom, one of a kind, cake stand made from pieces of wood that was built by Brooke's cousin. All of the wood that was used throughout the wedding (cake stand, guest book, table decor, etc) came from their family land near Bremond and Kosse. They will truly be keepsakes for generations to come! Custom wood pieces built by family using wood on their family land. Brooke and James, I have a wedding wish for you. Love is best when shared. Together you are stronger because together you are ONE. Here's to a happily every after! Thank you for allowing me to capture some of the memories from your beautiful wedding day! Special thanks to Angela Bailey and Angela Bailey Photography for assisting me in capturing the beautiful memories from Brooke and James's wedding day! I love weddings! Each and every wedding I have photographed over the past three years has been completely different. No two weddings have been the same. The details are all different even though they might be the same in theme. Each ceremony "feels" different. I'm not sure how to explain this aspect of a wedding since it's just something one experiences. Some feel more serious, while others feel more casual. I first met Brittany and Andrew in October of 2016 when we met in Hillsboro, Texas for their engagement session. I knew their wedding was going to be very special based on their interactions with one another at this session. I'll never look at a fire truck the same way again! On October 7, 2017 I photographed the wedding of Brittany and Andrew at The Eagle Historic Warehouse in Hillsboro, Texas. During the entire event, I couldn't help but smile. There was so much happiness! It just felt...different. As the evening progressed, I had a conversation with the other photographer, Angela, and we actually discussed how HAPPY everyone was. They smiled...a lot! They laughed...a lot! And they loved...a lot! The bride and groom showing off their FUN personalities before their wedding! More laughs by the happy couple! I absolutely LOVED the cake images! These images sum up their relationship perfectly! Always having fun and laughing. Special thanks to Angela Bailey with Angela Bailey Photography for assisting in capturing the memories of the Raley Wedding. That was the catch phrase for a beautiful day in September. 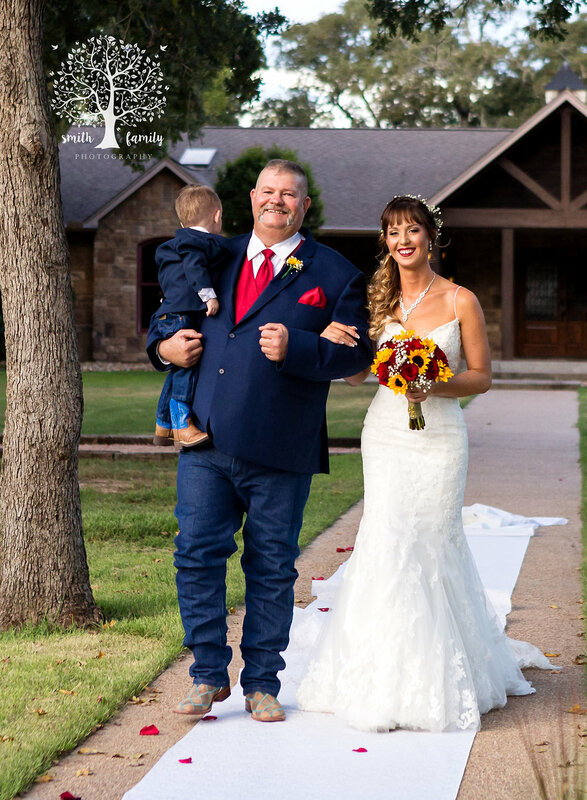 On September 30, 2017 McKenzie and Harlie were married at the Thornton Rodeo Grounds in Thornton, Texas. Everything about their wedding was GORGEOUS! I heard SO many guests compliment her dress, which was absolutely BEAUTIFUL! Harlie received so many compliments on her stunning wedding dress! When I meet engaged couples I like to hear "THEIR" story - how did they meet, what was the first date, how did he propose, etc. I first met Harlie and McKenzie at their engagement session in February of 2017. At that moment I just knew their wedding was going to be spectacular! They just had a chemistry together that others can see and feel. It's difficult to explain, but can definitely be experienced. At their engagement session I learned that they were high school sweethearts and both attended Groesbeck High School. McKenzie was one grade above Harlie, but they were both in the same Spanish class while she was a freshman and he was a sophomore. While they knew each other at this time, they weren't dating. However, just as the summer began they did start dating. One of their most memorable early dates was after Harlie's sister's softball game. McKenzie picked Harlie up so they could hang out. McKenzie was driving his 1992 Ford single cab pickup with a standard transmission. While they were on the way back to Harlie's house, McKenzie said he wanted her to try to drive his truck. Harlie, being the go-getter she is, jumped at the chance. She stalled the truck about four times and blinded herself when she accidentally turned on the bright LED lights on the gear shifter! She jumped out of the pickup and said she would never drive that truck again and they laughed the rest of the way to her house! Nearly six years later, McKenzie proposed to Harlie in their living room just a few days before Christmas in 2016. It was a quiet proposal with just the two of them in the living room. Harlie said is was sweet and romantic. Just the two of them. In their living room. With their ugly oversized Christmas tree they chopped down a few days earlier. It was definitely not the envisioned proposal (public with someone photographing the event), but it was definitely the perfect proposal! This Christmas tree was the perfect backdrop for the proposal! Harlie and McKenzie informed me that it was great being high school sweethearts for a lot of reasons, but mainly because they learned so much about each other through those high school years. They never had to introduce those awkward puberty days to each other because they were experiencing them together! They went on to say that it makes them feel accomplished in their relationship when they look back and see how far they've come in relation to all their friends' relationships that have ended. They've made it this far because they communicate with each other. COMMUNICATION IS KEY! Harlie explained that McKenzie is terrible at communicating at times so she has to make sure she is asking questions and updating him throughout the day to keep the line of communication open. As I write this at the age of 39, Harlie's words are running through my mind, "Communication is key." When McKenize is not communicating as well as she'd like, she picks up the slack and makes sure she takes the active role of initiating the conversation. This is so important! It's so easy to sit back when your partner is sitting back. But we all know when both people in a relationship sit back and no one takes the wheel, a wreck is inevitable. So today I challenge you to take the active role in your relationship and COMMUNICATE! Special thanks to Angela Bailey with Angela Bailey Photography for assisting with capturing the memories from this special day. Some people believe in love at first sight. Others believe in the idea of soul mates. Jessica and Matt are soul mates. I've photographed their family on multiple occasions over the past few years and when they asked me to photograph their wedding on August 12, 2017 I was honored...and surprised! Surprised because I honestly thought they were already married! Jessica and Matt's love story began with an online dating service, Christian Mingle. Matt's profile said he lived in Waco, Texas and he caught Jessica's eye. She's been hurt in the past so she was cautiously, yet optimistically, looking for her Prince Charming. They began talking on the phone and she realized that he did not live in Waco after all, he was actually living in Wisconsin where he was born and raised. Jessica admits that at that moment she thought to herself, "Great, I finally meet someone that seems nice and normal and I've actually been catfished." But Matt was not being deceitful. In fact, he said he lived in Waco because he was moving to Waco in the near future as he already put in a job transfer to the Waco area. He originally wanted to move to Waco to be closer to his two daughters. Meeting Jessica was just one more reason to make the move. Before Matt was transferred to Waco, he spoke to Jessica daily for several months. Both of them explain their relationship as a "good friendship." Matt eventually moved to Waco and Jessica helped him get situated into his new place. She helped him unpack and get him settled into his duplex. Jessica even showed Matt around Waco. She took the time out of her day to make sure he knew how to get to his office, as well as other places he would have to go to. Matt admits that he couldn't believe how thoughtful she was during this time. He found himself not being able to take his eyes off of her. She was absolutely beautiful and he was mesmerized by her gorgeous smile. He knew he was starting to fall in love. Over time, Matt earned Jessica's trust and friendship. Eventually he also earned her heart. As time went on, Matt knew he wanted to ask Jessica for her hand in marriage. He asked her three children for their blessing and with their approval, he began planning. During their family vacation in Wisconsin, Matt would put his plan into action. He gathered all the children onto one side of his parents house and he got down on one knee. They all called for Jessica and when she walked to the side of the house, she said, "YES!" Jessica and Matt decided to take the engagement slow. Neither one saw a need to rush into marriage. That is until Jessica became ill. She was hospitalized and Matt was her angel through the entire ordeal. She realized that Matt was her Prince Charming and she didn't want to wait any longer to become Mrs. Leonardelli. They began planning their perfect wedding. The details of the wedding were absolutely stunning! Everything was so thought out. Jessica planned out everything meticulously and credits Google and Pinterest for all the ideas. Everything worked with the venue, Castle Heights Bijoux Events Center, perfectly! Jessica's favorite part of their wedding day was having her dad there to walk her down the aisle and hearing the vows Matt wrote to her, as well as saying her vows to Matt. Matt's favorite part of their wedding day was also the vows. Special thanks to Angela Bailey with Angela Bailey Photography for assisting in capturing memories at Jessica and Matt's wedding on August 12, 2017. How much time do we need for wedding day photographs? Here is a rough guide to answer this question. Getting Ready: 30-45 minutes with both the guys and the girls. I always stay with the bride and the second shooter always goes with the guys. Some choose to skip photographing this time, but you can really get some great shots with lots of emotion! Bride and Bridesmainds/Groom and Groomsmen: 30 minutes, before the ceremony if possible. Again, this is just one chunk of time since there are two photographers. This time is great for getting many of the wedding party shots out of the way so guests don't have so long to wait for your arrival to the reception. First Look: 30 minutes with just the bride and groom, typically right before the ceremony begins. The first look is completely optional. Some couples like to keep things traditional and not see each other before the ceremony. Either way is perfectly fine...it's YOUR day! If you do decide on a first look, I highly recommend keeping this to just the couple. Use this time to enjoy each other before the wedding ceremony. The actual first look only takes about 10 minutes so you'll have plenty of time to have other photographs taken of you two as a couple. Whole Wedding Party: 30 minutes if you've already taken the bride/bridesmaids and groom/groomsmen photographs earlier. If not, you should plan for about 45 minutes here. Again, this varies based on the number in the wedding party as well. Immediate Family: 15 minutes, but this can vary based on how many groups you want to have photographed. It typically takes one and a half minutes per small group and three minutes per large group. Details: Detail shots are taken throughout the day so we don't actually "plan" for those. We just work those in as we can. Often times we do these if we finish early with the getting ready photographs or even during the reception. Now knowing this, when should you ask us to arrive? I suggest you figure out what time the ceremony will start and then work your way through the suggested timeline above to ensure you have enough time for us to capture all the moments you'd like photographed on your wedding day. Most of our clients opt for a "fake send off." They are able to have the send off photographed, but then come back into the reception to continue enjoying the company of their guests. This saves them money by not having a photographer stay the entire length of the reception, but ensuring that they capture all the big events from the day. But can you feel this magic in the air? Ron and Beth's wedding on June 3, 2017 was in fact, a true fairytale. On February 13th, Beth contacted me about photographing their wedding. At that time, she described their relationship as a fairytale. She actually told me this in a message! Their wedding day truly lived up to this title! They were getting married at the Chapel at Caliber Oak in Salado, which is absolutely beautiful. They planned for an outside ceremony with the reception inside. The weather was stormy most of the day and arrangements were put in place to move the ceremony indoors if that was needed. The storms stayed away for the entire ceremony so Beth and Ron were able to have their perfect outdoor ceremony. Everything went as planned - perfectly! It was a fairytale wedding. Ron and Beth knew of each other for a very long time. Ron's mother worked with Beth years earlier. Neither thought they'd end up married! About six years ago they were hanging out with the same group of friends...all married couples. Ron and Beth were the only single ones in the group. They ended up going out to eat once alone, then they went to the movies a few times alone, and then dancing. The rest is history! Their age difference of six years was a joke between them in the beginning, but they they soon got over that and were inseparable. Their first "real" date was dinner and a movie. Beth explains that Ron was a true gentleman that opened the door for her and treated her with respect. This was new to her. As the date progressed, they laughed and talked about how they both just wanted to be happy. Their relationship just grew from there. On Christmas Eve, Ron proposed. They just returned from his parent's house and he was unloading the gifts from the truck. When he came inside, he set the gifts down (or at least she thought he was setting the gifts down), but instead she saw Ron holding a Boozer's Jewelry sack. He approached Beth and told her to close her eyes. She closed her eyes and he proposed. Of course she said, "YES!," and hugged him! She says she was caught totally off guard and it was absolutely perfect. One night after the proposal Beth couldn't sleep. She decided to do an Internet search for "small church Salado." The Chapel at Caliber Oak popped up and she immediately sent an email right then...at 2:30am! Just a few minutes later, Rick replied and told them that the venue was available because someone had canceled. When Ron and Beth visited the chapel, they instantly knew that was the perfect place for their fairytale wedding. She said it was truly magical! Beth says her favorite part of their wedding day was seeing Ron's face when she walked out. She saw the smile on Ron's face and it matched the smile in her heart. She knew it was the beginning of their forever. Ron says the favorite part of their wedding day was when the minister said, "You may kiss your bride." They both waited a long time for the happiness they now share. Their long journey has definitely been a fairytale with a happy ending. Everything was absolutely PERFECT! Thank you Ron and Beth for asking me to help capture the memories on your wedding day. And a HUGE thank you to Angela Bailey with Angela Bailey Photography for assisting in capturing those memories! Meet Mr. and Mrs. Jackson! Meet Spencer and Cheyenne Jackson. They tied the knot on January 7th, 2017 at the historic Allen House in Marlin, Texas. The Allen House was built in 1911 by Dr. Walter Hanz Allen and his wife Nettle Falconer Allen. Today the house operates as a civic center and provides a unique atmosphere for weddings, receptions, retreats, and many other functions. If you'd like to learn more about the Allen House, you can read more here. The historic Allen House in Marlin, Texas. They had an eventful first date in Waco as they began to get to know one another over dinner, followed by a movie. They ended their night with a little game that’s native to Wacoans – tortilla tossing off the suspension bridge at Indian Springs Park. Spencer and Cheyenne decided to have a small, intimate wedding on the front porch of the historic mansion lit by candles. The wedding was at 6:00 pm so it was very dark outside, but the lights from the candles and porch lights cast a very romantic, candlelight for the ceremony. Did I mention it was FREEZING? It was seriously like 25 degrees outside! The fact that it was so cold seemed irrelevant because the ceremony was so beautiful…a true love story. Spencer and Cheyenne's wedding on the front porch of the Allen House. On November 5, 2016 I had the pleasure of photographing the wedding ceremony between Robert Hickman and Brandy Vincent. This was much more than a wedding ceremony between a man and a woman that completely and utterly adore each other - this was also a union of a blended family. You see, Robert has one son from a previous relationship and Brandy has two children, a daughter and a son, from a previous relationship. I have known Robert for several years. We first met when his son and my son played little league baseball together in Mart, Texas. I later met Brandy through Robert at...you guessed it...through little league baseball! From the very minute I saw Brandy, Robert, and the three children interacting, I knew they had something very special. Something that not every blended family has - unconditional love for one another. At the wedding rehearsal I wasn't shocked that their children were involved in the wedding ceremony. Their two sons were groomsmen and their daughter was a bridesmaid. But something else that happened made this a very emotional event for all of them! During the rehearsal Brandy told her two children that THEY would be walking down the aisle to give her away during the ceremony! I can't even begin to explain the emotions! There were plenty of happy tears and even more hugs. This very moment was the highlight of the entire wedding rehearsal. Throughout the entire wedding ceremony the children were included and I personally feel that including the children in the process helps them feel like they're part of the new family that is being created through the marriage. Brandy and Robert did an excellent job at planning their wedding. Everything was absolutely beautiful! But the one thing that stood out to me was the way they used this ceremony to create a new family by including them in the blending process. I came up with 5 ways to blend families with children at weddings. 1. If they are old enough to do so, let them help with the planning. One way you can let your children help with planning the wedding is by letting them help pick some of the music for the reception. Kids LOVE music! Many girls also LOVE crafting! If they do, let them help assemble decorations. There are a gazillion ways your kiddos can help when it comes to planning the wedding. You know your kids better than anyone else so give them a "job" and let them run with it. 2. Let your children invite some of their friends to the wedding. Being a part of a wedding as an adult can be stressful. Being a part of a wedding as a child can be stressful as well. If you let them invite their best friend, they will have their support system right there. Obviously this is also dependent upon the age(s) of your children. Having a friend there gives them someone to feel comfortable with...someone to talk to...dance with...and laugh with. 3. Include the children in the actual wedding ceremony. As I already mentioned, Brandy and Robert included all three of their children in the wedding ceremony. It made them feel as if it was a family event rather than an event between the adults. 4. Create an event during the ceremony that includes the children. A popular event during the ceremony that includes the children is a sand ceremony. Robert and Brandy chose to do a candle lighting ceremony which involved the children. Creating an event during the ceremony that includes the children is in essence sharing the vows with the children. 5. Give the children a REAL role in the wedding ceremony if they would like one. I touched on this point earlier when I discussed how Brandy asked her children to walk her down the aisle and give her away during the ceremony. Depending on the maturity level of the children, allow them to have a REAL role if they'd like one. A wedding day can be described as beautiful, timeless, romantic, fun, exciting, precious, emotional, traditional, and memorable. Some might add that a wedding day can be chaotic, stressed, busy, frantic, and nerve-wracking. And for that very reason, some couples choose to partake in a First Look Photograph Session either before their wedding day or on the day of their wedding. On October 1, 2016 I had the pleasure of photographing the wedding of Kenley Crowe and Joanna Richardson at Common Grounds in Waco, Texas. They opted for the First Look Session before their wedding...and it was an amazing experience! Seeing the look on both of their faces as the anticipation built as Joanna slowly walked to meet Kenley was priceless - almost as priceless as seeing the look on his face when he saw Joanna in her beautiful wedding dress for the very first time. So much emotion. It was just those two...at that moment...on a day when so many others would be around them on their special day. Some might say that a First Look Session ruins the anticipation of the groom seeing the bride for the first time as she's walking down the aisle. However, I can attest that this is not the case. Even if the groom sees the bride at a First Look Session, he is still overcome with emotions as he watches his bride walk down the aisle on her father's arm. I decided to compile a list of the five reasons couples would choose a First Look Session. Keep in mind, these are just a few of the reasons why some choose this type of session. Ultimately, each couple knows what they want on their wedding day. 1. Convenience and Time. Traditional weddings usually do the bridal party photos, as well as bride and groom photos, right after the ceremony. They are often rushed as they don't want to keep their guests waiting too long to begin the reception. The First Look Session allows the bridal photos to be taken before the ceremony so guests do not have to wait for the bridal party to arrive at the reception. 2. Alone Time. Wedding days are filled with friends and family members surrounding the bride and groom. The First Look Session gives the bride and groom a small amount of time to just be with each other before the ceremony begins. 3. Reception. First Look Sessions allow the wedding to run smoothly from the ceremony to the reception. There is not any downtime due to bridal photos. This is more pleasant for guests. Traditional weddings typically have guests waiting an hour or so while the bride and groom are having bridal portraits taken. 4. Better Photos. As a photographer, I feel that First Look Sessions allow me to spend more time with the bridal party. Therefore, the photos are not as rushed which in turn makes for better portraits. 5. Family and Friends. The First Look Session allows the bridal party to spend more time with family and friends during the reception since they aren't missing out on this precious time after the ceremony taking bridal photos. I'd love to hear from you! What are some other pros of having a First Look Session? Planning a wedding is one of the most exciting times in a person's life. You are planning the day that you commit to sharing your life with another person forever, as well as planning the day that your friends and family will be celebrating this momentous day with you. Traditional weddings can be rather costly, which make a backyard wedding an ideal choice for those couples that are looking for a venue that is more intimate, unique, and memorable. I recently photographed a wedding, a backyard wedding, of Kia and Madison Deems. Their wedding was absolutely beautiful! And as I work through the photographs of their special day, I began thinking about five tips for the perfect backyard wedding. 1. Location! Let's face it, traditional venues can be very expensive! Backyard weddings take this expense away since the bride and groom typically use a backyard that belongs to a family member or friend. When choosing a backyard for your wedding, consider the location. What type of location or setting are you going for? Trees? Rocks? Flowers? Waterfront? 2. Bugs! If you are planning a backyard wedding, you must take bugs into consideration - especially in Texas! You want your guests to be comfortable and enjoy themselves at your celebration, not spend the evening swatting at mosquitoes. 3. Space. When planning your backyard wedding, you must consider the amount of space available for guests. You don't want to invite so many people that you run out of room for your guests. Obviously, the larger the backyard is, the more guests you can invite. Often times, couples choose a backyard wedding to keep the special day small and intimate with those closest to them. 4. Lighting. Backyard weddings can be very dark if the reception spills on over into the evening hours. For that it is necessary to have adequate, yet romantic, lighting so the guests can mingle with the bride, groom, and other guests. There are so many creative and unique lighting ideas for backyard weddings! 5. Entertainment! Every wedding, even backyard weddings, need some entertainment. Some couples choose to have a dance floor under a tent, while others choose to have lawn games. Kia and Madison chose to have a giant game of Jenga at their wedding! Backyard weddings are very unique and creative. They create lifelong memories for the bride and groom, as well as the guests. When planning a wedding, remember anything goes! It's your day so make it exactly what you want! Thank you Kia and Madison for giving me the opportunity to photograph your special day! It was truly an honor. Special thanks to Amber Payne, my dependable other half at weddings. Thank you for all that you do!